Florida Panthers Executive Vice President & General Manager Dale Tallon announced today that the club has agreed to entry-level contracts with G Michael Houser and D Josh McFadden. Houser, 19, won the Red Tilson Trophy as the most outstanding player in the Ontario Hockey League recording a 46-15-1 mark, while playing for London last season. He also was the first American-born player and first player from London to be named the Canadian Hockey League's top goaltender. The Wexford, Pa. native posted a 2.47 goals-against average, had six shutouts, with a .925 save percentage. Houser played in a Canadian Hockey League-high 3,698 minutes last season, while tying the OHL record for wins in a season with 46. 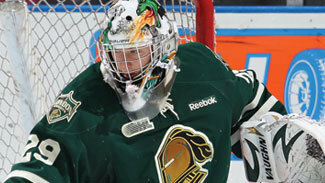 He helped London win the OHL title and advance to the Memorial Cup championship game. He was No. 16 in NHL Central Scouting's final ranking of North American goalies for the 2012 NHL Draft, but went unselected. 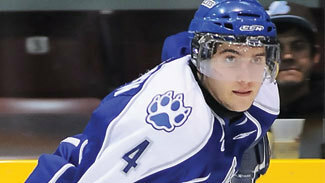 McFadden, 21, has spent the last three years playing for the Sudbury Wolves (OHL). Last season, he led team blueliners with 41 points, including 15 goals in 47 games played. During the 2010-2011 campaign, the Guelph, Ont. native recorded a career best 19 goals with 53 assists, while pacing the Wolves with 72 points. The 6-foot-1, 210-pound defenseman also served as team captain for Sudbury during the 2011-2012 season.